There is a popular saying that, one can rediscover oneself by only a few ways! And one of those is to travel. Yes, Travel! We all need change, once in a while, and change might not necessarily mean new clothes, new friends and a new diet. Sometimes, one needs to break free from all the shackles of work, thoughts etc. and just unwind. For me, the best way to take a break is to travel to places I have never been to. This year I have traveled quite a bit, compared to my usual years. I hope you have read my posts about my travel to Himachal Pradesh, from earlier this year! If not, click here togive them a read! Continuing with my travel posts, I am back with one more, and this time it is about my travel to another Hill Station, KodaiKanal! How to get there From Bangalore: Let me give you a quick overview, of how to get there from Bangalore. Now you can reach Kodai Kanal from Bangalore, by train or by bus or you can drive down there as well! 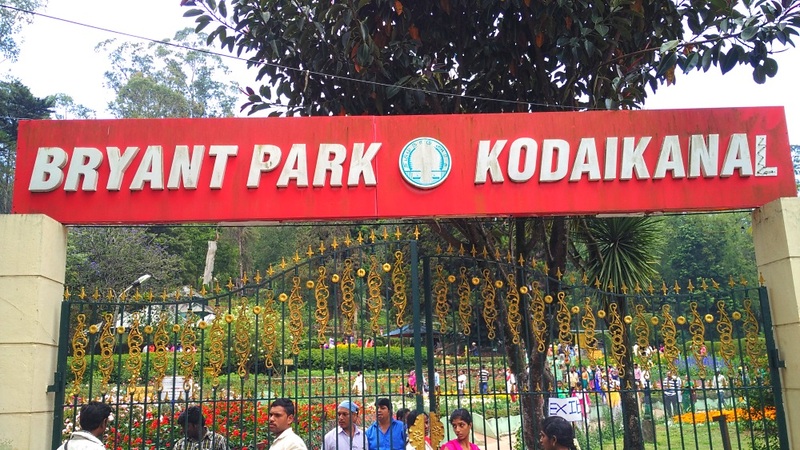 There are two trains, from Bangalore, that go to Kodaikanal road, NOT KodaiKanal and from there, you can get a bus or book a car to shuttle you to KodaiKanal. It takes around 3 hours from the station to reach KodaiKanal. Or you can directly reach there by bus. The bus stand is in the heart of the city, and you won’t have much of a problem getting to your hotel from there. You can also rent a car, right from the bus stop. The rent depends on how many “places” you want to see, and the type of car you want to rent. At the church we found! They also have a rent option on a per person basis, so if you are okay with sharing the car with other people, you’ll be able to go around KodaiKanal for just 200-250INR per person! So, we decided to explore as much as we could, on foot, on our Day One. Day one was all about staying around Kodai Lake and covering everything we could in the vicinity. So, we went to Coaker’s Walk, Bryant Park, shopped a bit and went paddle boating on Kodai Lake. Paddle Boating is open till 5:30pm and there is always quite a long line for the tickets. I’d suggest you plan this beforehand so that you don’t miss out on it. Coaker’s Walk is a beautiful, beautiful pathway, which has an absolutely stunning view of the hills and the city, covered with clouds and, a bit of the chilly air to add to the spectacular experience. Bryant park takes you right back to the Bollywood movies from 70s and 80s. Dotted with beautiful flora of various varieties and nicely landscaped garden, this place is quite nice to relax for a while. Near Bryant Park, there are a number of shops selling spices, chocolates and a number of local handicrafts. Do check out the prices at different shops before making a purchase, because the prices vary a lot. We also discovered a small, quiet church with no tourists at all near Kodai Lake. We spent a lot of time here.It's quite and serene , away from the hustle- bustle of tourists. On Day Two, we went out in our rented car. We wanted to visit Berijam Lake, but there are only 30 passes each day which are given to only 30 vehicles, and we couldn’t get one on time. Moir point is the place where you get your pass from for the lake, but don’t spend a lot of time here. Nothing much to see and bit too crowded. And it started raining within a few hours of us being on the road. Make sure you start a bit early, because there is only a single, one way road which will let you go around to the spots to visit. Guna Caves is currently partially closed, but this place has a creepy vibe which is something you’d like to experience. The pine forest is a beautiful place to be, with giant pine trees touching the sky. It’s a good place to click a lot of pictures and roam about for a while. It also is very quiet inspite of being crowded. Next, we visited the Pillar Rocks. When we reached there, it was about to rain and the clouds were looming on the rocks, so we couldn’t see them clearly. It started pouring within a few minutes and we had to halt for a while. The Green Valley was on our list, but since it continued to pour heavily, all we could see was, nothing. The final destination on our list was Dolphin’s Nose, in Vattakanal which is about a 3.5 km trek through some patches of hilly road. Since it was raining constantly, we went half way & then keeping safety in mind: aborted the mission. This stretch is very serene & at the end of the trek, there is a café called Altaf’s Café which is quite popular for their Israeli delicacies. We were quite disappointed that we couldn’t make it, but hey there is always a next time. After this we called it a day, and decided to chill out a bit. Our bus was in the evening on the third day, so we again decided to explore more on foot. The bear shola falls was nearby from our hotel, so we walked down there and but found a dried up fall with a lot of vegetation around. Thankfully we all had an umbrella each, because it started to hail after sometime! Yes! It was quite a lot of fun to just stand in one place and experience that! I shopped a bit, not clothes :P. Picked up a few fresh fruits and more chocolate. We had our lunch and decided to end the trip on a good note with some ice cream! But, the one thing I wanted to do was visit a cheese farm nearby, which wasn't possible because of the rains! But, you guys do visit and let me know how it is! There are a lot of local eateries selling various food items. Do try them out! Buy a lot of fresh vegetables and fruits, quite a lot of them are not easily available to us otherwise! Please send me a mail at priyanjanamns@gmail.com , if you have any queries, or need the number of the hotel I stayed in or the car I rented. Hope you liked reading this blog! I will try clicking more pictures from my next trip, couldn’t get a lot of pictures in this one, since it was raining most of the time! Kodai has a charm. But sadly most of the flora is starting to vanish. It seems like you've an amazing time.